For January, I was challenged to take part in Veganuary and let me tell you now, it was not easy. I can't say I was surprised at how little products are actually Vegan but it was frustrating when you are starving hungry and what you would usually grab you can't because it's not Vegan. I'll hold my hands up and say I caved after 17 days, my family and I are very much meat lovers and when you have a full roast dinner with some medium roast beef sat in front of you, I absolutely could not say no. The number one Vegan snack has got to go to Nakd*, with their now quite extensive range of fruit and nut snacks. Ranging from Nakd Bars to Oatie Bars to Raisins and Nibbles. They are made from just raw fruit and nuts, and are wheat, dairy and gluten free! I loved that they kept me refuelled until my next meal when I got hungry mid-morning/afternoon. They also were one of my five a day, which even though I was having PLENTY of fruit and veg, I knew I could get it in the form of a Nakd Bar too. 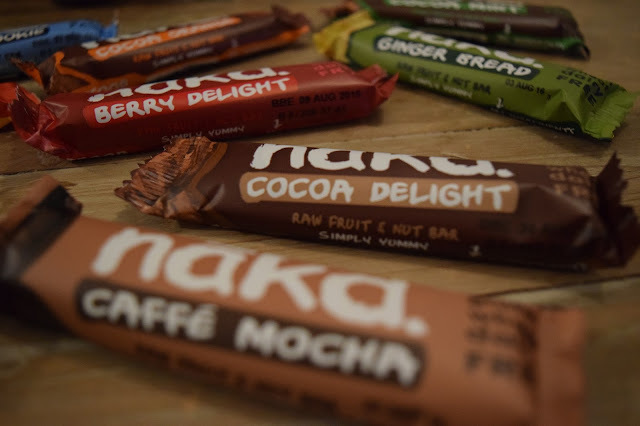 My favourite flavour had to be the Cocoa Delight and I would absolutely love to try the Nakd Bits and Nakd Infused Raisins. This is one of my new favourite fruit snacks. 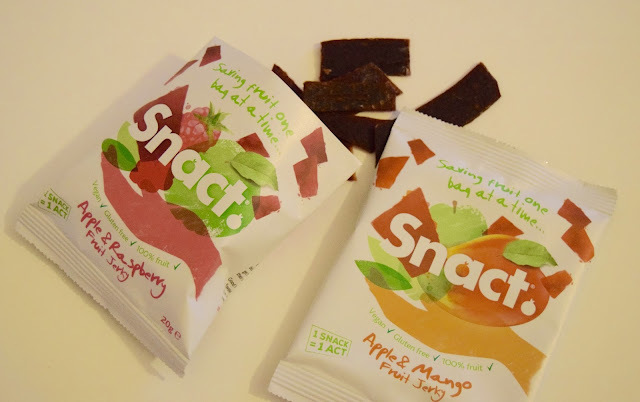 Snact* comes in two flavours: Apple & Raspberry and Apple & Mango. Two of my favourite flavour combinations! These snacks are 100% fruit, Vegan, gluten free, less than 65 calories per bag and made in the UK. 1 bag is also one of your five a day, I often find that if a product advertises this then I am more inclined to buy it, as I can eat it on the go, unlike most fruit. The snacks are made from surplus produce, so they cut down on fruit being thrown away for whatever reason. They are SO delicious, think a posh fruit winder but so much better. You can buy your own from their website, 5 packs for £4.50 or a mixture of 6 packs for £5. You won't regret it! 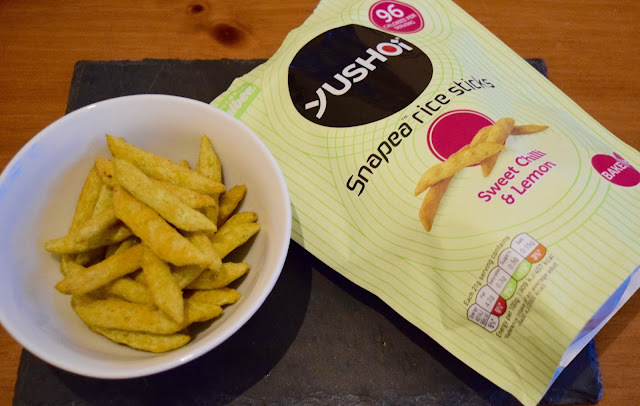 A bit of a different snack from Yushoi*, these Snapea rice sticks are a savoury baked snack made from green peas and rice, sprinkled with 4 different flavourings: Lightly Salted, Sweet Chilli & Lemon, Soy & Balsamic Vinegar and Smoked Salt & Szechuan Pepper. My favourite flavour had to be Sweet Chilli & Lemon! All flavours are less than 96 calories per serving, and each serving is big enough to fill that hunger pain. They are a source of protein, high in fibre and most importantly Vegan! They were great to have during Veganuary and you can get your own from Tesco and Co-Op! When the box came to my door packed full with Dilly & Wolf*, I was so excited! Dilly & Wolf have launched a new range of pulse-based 'pots of goodness' - in their own words! But I really have to agree! They are a mixture of peas, beans and seeds in a wide variety of flavours and are really packed full of taste. They are amazing sources of protein and fibre - nutrients I find are the harder ones to come by, especially during Veganuary! Oh, and they're British grown which makes it so much better. The range is called 'Roasters' and the peas, beans and seeds are roasted, tasted and baked, hence the name for the range! They are perfect for grabbing as a snack on the go. They come in resealable tubs of 100g and have 4 portions in each tub ranging from 94-108 calories. I knew I would love the wasabi and horseradish roasted peas and with a lot of restraint, I ate the pot in 4 portions! I also love the Sweet & Salty and Sea Salt & Cider Vinegar Peas, Beans & Seeds. I was really unsure of what to make of the Soy & Ginger and Coconut & Chilli. I wasn't overly keen on the Soy & Ginger as the flavour combination just didn't work for me. However, I really enjoyed the Chilli & Coconut, I don't like coconut that much but this flavour combination worked for me! You can get your own 'pots of goodness' for £1.50 a pot, and absolute steal if you ask me. They can be found at Marks & Spencer, Ocado and Hodmedods.